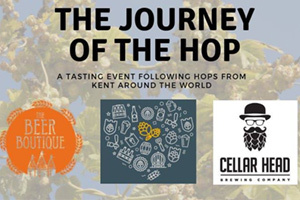 The BeerBoutique (Mount Pleasant) will be teaming up with Cellar Head to bring you a series of beers showcasing how terroir and country of origin so drastically affects hops. Starting with tried-and-tested classic English varieties, we'll work our way through traditional and modern English hops through to their descendants, then down to the specifics coming from modern hop innovations. A traditional English ale can't be beat, but how does it fare next to a modern DIPA full of Cryo or BBC hops, or stuff grown on the other side of the world? You can decide which tipple suits you best as you follow the hop from its origins in the south of England to the New World. Part of the Tunbridge Wells Beer Weekend.